On February 18, Teymur Fatullayev ’15 teamed up with the FLEX Alumni Coordinator in Azerbaijan Fatima Huseynli ’13 to organize an educational seminar titled ‘Read to Lead’. 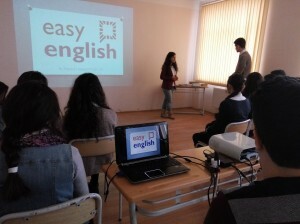 The event took place in the city school #8 in Sheki, Azerbaijan and was attended by 24 students. The aims of the seminar were to encourage the participants to read books and learn English independently. The FLEX alumni talked about the importance of extracurricular reading and explained how to turn it from a chore into a hobby. Moreover, Teymur shared a list of websites where free books can be accessed and Fatima conducted fun English language activities for the students. ‘Attending the South Caucasus FLEX-Ability Workshop was very useful. Through observing my trainers I learned how to express myself and give presentations to students,’ notes Teymur.